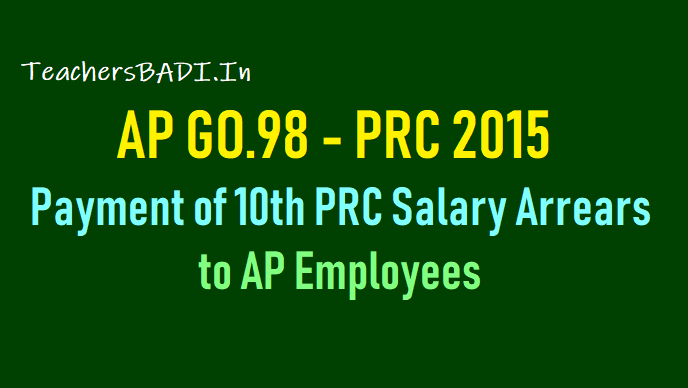 Payment of AP PRC 2015 Salary Arrears to AP Pensioners, Employees (GPF, CPS Holders): AP PRC 2015 was given to Govt Employees as per G.O.Ms.No.46 Dated: 30-04-2015 with 43% Fitment notionally from 01.07.2013 and with monetary benefit from 02.06.2014. Cash was paid from April 2015. The benefit of the Revised Scales of Pay 2015 shall be paid in cash for month of April 2015 onwards. Separate Govt Orders issued for payment of arrears of salary in Revised Scales of Pay 2015 for the period from 02.06.2014 to 31.03.2015. Now the Govt of AP has decided to Pay the Arrears of PRC 2015 in cash. It is good news for AP Government employees. AP Gvot gave nod for the payment of long-pending arrears under the PRC (Pay revision Commission) which came into force on June 2, 2014 to the employees. The pending arrears for nine months between June 2, 2014 and February 2015 would be paid in cash. The PRC arrears of AP employees who have GPF accounts be paid in cash for one month viz., March, 2015 in cash in the month of November, 2018. The arrears for the remaining nine months viz., from 2nd June, 2014 to 28th February, 2015 shall be credited to the respective GPF Accounts of the AP employees in the month of November, 2018. In respect of employees who retire before 31.3.2019, the arrears shall be paid in cash in the month of November, 2018. In respect of employees covered by Contributory Pension Scheme (CPS), ten percent (10%) of amount along with Government contribution shall be credited to their PRAN Accounts in the month of July, 2018 and the remaining ninety percent (90%) shall be paid in three instalments i.e., on 1st of September, 1st of October and 1st of November, 2018. In respect of pensioners, ten months arrears shall be paid in cash in three instalments i.e., on 1st of September, 1st of October and 1st of November, 2018. GOVERNMENT OF ANDHRA PRADESH :: PUBLIC SERVICES - Revised Pay Scales 2015 - Payment of Arrears - Orders - Issued. 4. Representation of Joint Action Committee of Employees, Teachers, Workers and Pensioners, Andhra Pradesh, Dated: 29.05.2018. 6. Representation of Andhra Pradesh Gazetted Officers’ Joint Action Committee dated 29.05.2018. The PRC arrears of employees who have GPF accounts be paid in cash for one month viz., March, 2015 in cash in the month of November, 2018. The arrears for the remaining nine months viz., from 2nd June, 2014 to 28th February, 2015 shall be credited to the respective GPF Accounts of the employees in the month of November, 2018. In respect of employees who retire before 31.3.2019, the arrears shall be paid in cash in the month of November, 2018.